Here are a couple of videos that show in detail how the Garden Tower works. I wrote about it back in April. Although I have no hands-on experience, it looks to me to be a productive new way to grow some fresh vegetables in confined urban spaces. Go to Kickstarter if you are interested in supporting this new system. The vertical "African sack garden" form and Larry Hall's rain gutter sub-irrigation system are two of my favorite urban food production concepts. I believe we will see a variety of these systems in widespread use in the future. I'm looking forward to gaining some first hand experience in the current growing season as my new knee heals. I have several ideas to test. We can thank Jose Luis Castañeda in Guadalajara, Mexico for giving us a link to photos of his rooftop garden. He has done a great job using Larry Hall's rain gutter sub-irrigation system. His pristine white bucket planters in perfect alignment on the rain gutter reservoirs have a pleasing look even without decorative concealment. If these were on my patio, it wouldn't bother me at all to look at them. I also wouldn't be bothered by having to water them individually since the rain gutter float valve makes watering automatic. Note in the bottom photo that he is also experimenting with sack planters on the rain gutter system. He also shows a bucket planter with side planting holes a la sack gardens. I'm not sure if it is irrigated on the rain gutter system. I related to Jose's comment about the difficulty in changing embedded human habits. This is particularly true in home gardening when so many of its practices are based on folklore and family tradition often passed down from mother to daughter. Since January 2010 i've been teaching people in Guadalajara, Mexico about sub-irrigation and believe me, hasn't been easy. At first, people don't understand the system, later they do, but they keep skeptical, finally they don't put into practice what they have learned, maybe i'm not that good at teaching. What i mean is that is hard to remove the idea of top watering and drain holes, i'm guessing this paradigm is worldwide. Take a look to this photo album https://picasaweb.google.com/116282453914033980750/AltairaSubIrrigatedRooftopVegetableGarden it's our sub-irrigated garden on a rooftop. 800 million people worldwide have had their food security improved through UA. 60% of the world’s population will live in cities by 2030. 15-20 % of the world’s food is produced by urban or peri-urban agriculture. 40% of total urban food requirements in Kampala, Uganda, are accounted for by UA. The Technical Centre for Agricultural and Rural Cooperation (CTA) is a joint international institution of the African, Caribbean and Pacific (ACP) Group of States and the European Union (EU). The following article is from the Feb-Mar 2012 issue of Spore, a CTA publication. It is worth reading to better understand how a simple gardening technique like vertical sack gardens can help solve worldwide problems of urban food supply and hunger. Keep in mind that with the availability of modern materials available here in the U.S. these sack gardens could be even more productive and sustainable. I have several ideas waiting on product testing but at this time no location to do it. Over and above the sack gardening idea, it is also worthwhile for Americans to know that there are organizations outside the U.S. who are arguably doing a better job of consumer education than our vaunted, but in my view over-rated USDA Extension Program. Our urban botanical gardens are no better; witness the gardens here in New York City that teach nothing but dirt and drain holes. We desperately need new thinking and new blood in the field of urban food production. It is not likely to happen when city kids are being taught that shovels, hoes and rakes are modern instruments of urban agriculture. The dig and “get your hands dirty” mantra of dirt-hugger educators is a dead-end message except for those who choose to live in farm country. That is an unlikely future for the overwhelming majority of young people living in the city. Two simple technologies are helping urban dwellers to grow fresh produce in very small spaces. The result is more varied diets for families and extra income from the sale of surplus output. With a population of one million, Kibera slum in Nairobi, Kenya, is one of the largest informal settlements in Africa. It is also one of the unhealthiest, with open sewers spilling raw sewage into the narrow alleyways. Now urban farming is helping to improve diets through hygienic agricultural practices in limited spaces. Here is yet another creative idea about sub-irrigated planters (SIPs) from YouTube. In this case, the grower is using SIPs made from recycled utility buckets. The clever modification is the addition of holes drilled in the sides to make a vertical garden a la African sack gardens. Note also that he uses a fabric wick rather than a wicking container. It is not well known that many commercial SIP type planters use nylon or polyester fabric wicking. This is particularly true of those made in Europe. Although not shown in the video the designer of the planter suggests stacking them 2 or 3 high. These are very exciting ideas well worth further exploration and testing. Imagine coupling this vertical garden idea with Larry Hall's rain gutter SIP system. Perhaps we can get Larry to test one or two of these planters. Now that you have the basics of this system by watching the first two videos I share with you my "ultimate container". I don't know of a better container to produce more food in less space than this ultimate container. Due to many reasons including the variations of plants, the density of planting and the ability to stack these containers make them the ultimate container for container gardening. Imagine being able to grow forty plants in a one foot area! School Gardening » Send a Cow to NYC...Please! Bag Gardens in a UK school from Send a Cow on Vimeo. Quote, "Hum, I'll give it a chance!" Cheers to the educators in this U.K. school. Making a Bag Garden in Uganda from Send a Cow on Vimeo. Send a Cow could do much good work here in New York City where we have a very small group of highly vocal but uncreative "three sisters farmers" who seem to know just one note on a scale of many notes. They play ad nauseum only in the key of "d for dirt." Apparently that is all they know...or want to know. We would be much better off as a society if children were taught school gardening to honor all cultures and learn to play all the notes in the scale, in all keys. These African style Bag Gardens are a great project for school kids to get stuck into. See how they did just that in a school in Bath, UK. Bag gardens are part of the African Gardens project run by charity Send a Cow. See SendaCow.org for more info and to buy a kit. Following are screen shots from the Wisconsin PBS video about sack planters on the parking lot of a Salvation Army pantry. I have added further explanation and comments about this highly productive and inexpensive way to grow vegetables in the city. A layer of gravel is poured into the bottom of the sack to create a base. I would add a layer of pourous nursery fabric or plastic screening to prevent soil from seeping into the gravel base. This retains air space between the pieces of gravel. Position a can (with the top and bottom removed) in the middle of the sack on top of the gravel base. This will act as a mold or form for a gravel column that will go from the bottom to the top of the sack. Add soil until level with the top of the can mold. An alternate method is to create a center core for the gravel column by using a piece of window screen material rolled into a round column shape to form the core. The screen retainer would rise from the gravel base to the top of the planter in one piece. What is not quite clear in the video is that she lifts the can out of the soil at the bottom of the sack. The gravel stays on the bottom of the planter. Now reposition the can on top of the first soil/gravel layer, fill with soil around it, add gravel and repeat this procedure until reaching the top of the sack. The planter is complete. Here you can see the gravel column that facilitates flow of water from top to bottom throughout the sack planter. Equally important are the pore spaces between the pieces of gravel that provide all important oxygen to the root system. I have other ideas on using this basic system to make vertical planters like these even more productive and durable. Stay tuned. This is a very productive, low cost sack planter demonstration garden. Why is it that we do not have a garden like this (including raised bed sub-irrigated planters, SIPs) here in the biggest city in America? Why is it that planters like these are not included in the so-called USDA Peoples Gardens? My plan is to find locations in all five boroughs to give the people of New York access to information about safe, productive, space saving methods of growing food in the city other than in a dirt box or often-contaminated city soil. I have several ideas about variations to make this sack planter method more durable and even more productive. Stay tuned. Please contact me if you know of a location with public accessibility. It could be a school or current community or neighborhood garden. Brooklyn is my first priority to get this program off the drawing board and on the ground. 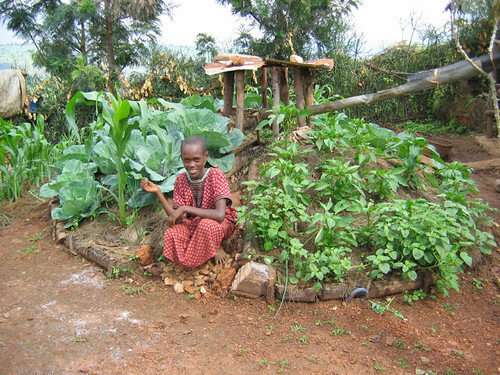 Following shortages after the post-election violence in Kenya in early 2008 and faced with soaring food prices, Solidarites International, a French NGO, implemented a “sack garden” project in Nairobi’s slums where more than 60% of the population lives. Solidarités International main strategy was based upon two major objectives: 1) to increase access to food using the “garden in a sack” concept; and 2) to increase the income available for household use through the sale of vegetables from the garden in a sack. Watch How to Grow Food in a Burlap Bag on PBS. See more from THE WISCONSIN GARDENER. This garden is in Appleton, Wisconsin but its origin is African. The garden is growing on the parking lot of a Salvation Army pantry. Its purpose is to demonstrate how to grow food in burlap bags. Susan Richardson: But we're doing this as a part of a partnership with Salvation Army. To assist food pantry recipients in learning how to grow food, and to grow food in unusual spaces and in spaces where they don't need a lot of land. We are doing this as a result of a grant that we received from the Community Foundation of the Fox Cities. It's part of the Basic Needs Giving Partnership Grant. We're a program of Goodwill Industries, so we have a lot of participants in this particular project, including food pantry participants, who have grown this food. 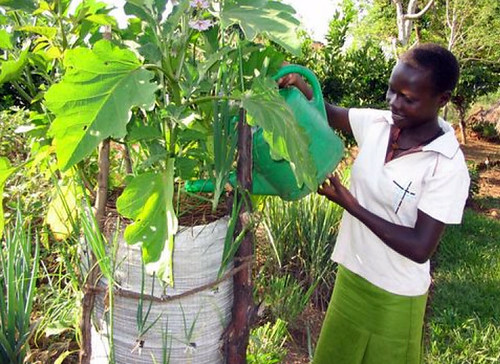 The sack planters in this video are based on a method that is used widely in Africa. What really got my attention is the quality of the vegetables growing in the sacks. These are healthy plants producing very healthy looking vegetables. The vegetables are of the quality one would expect to see from growing in sub-irrigated planters (SIPs). The light dawned in the video segment demonstrating the making of a sack planter. Just as in SIP growing, the answer is oxygenation of the root system. Just like SIPs with water and oxygen reservoirs, these sack planters have an oxygen tank installed down the center. What a simple, but obviously very effective method this is. A significant benefit of this system is that the oxygenation is not dependent on capillary action from reservoirs at the bottom. The soil media does not need to have the high level of capillarity that is characteristic of artificial media made with peat (or coir), bark and perlite. These sack planters can work with a heavier mix of native soil and compost. That, of course, is why sack planters are popular in low-income regions of Africa with no access (or affordability) to bagged artificial soil mixes. There will be more posts about sack planters and I am looking forward to some hands-on experience with them. Like SIPs, these planters also belong in the so-called Peoples Gardens that currently are populated only with traditional dirt boxes.